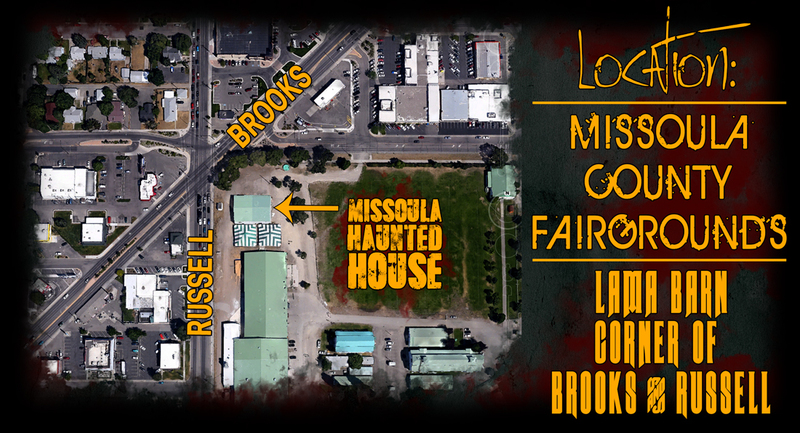 The Missoula Haunted House is located in the Llama barn on the corner of Brooks and Russell at the Missoula County Fairgrounds. There are two main entrances to the Fairgrounds, The entrance on Russell Street and the Entrance on South Ave. When entering from Russell you will drive into the fairgrounds and stay left heading past the ice rink (the ice rink it will be on your left) and onward to the Haunted House (it will also be on your left). If you are entering from South Ave. you will need to drive down the long driveway and take a right through a second gate. Drive past the commercial building and the building where voting is held, these buildings will be on your left, and continue driving straight towards the ice rink. At this point you should see the Haunted House kitty corner to your right. As you reach the ice rink you will take a right and continue to the Haunted House.